In review­ing the 1940-45 vis­i­tors books at Che­quers, I was struck by how often Pro­fes­sor Freder­ick Lin­de­mann was there—far more than any­one except Churchill fam­ily and staff, more than Bracken and Beaver­brook, let alone the Chiefs of Staff. Lin­de­mann prac­ti­cally lived there and was present when­ever Churchill was. What do you make of him and what’s best to read on him? After the death of the F.E. Smith, the first Lord Birken­head, Fred­er­ick Lin­de­mann (1886-1957) was prob­a­bly Churchill’s clos­est friend. His sig­na­ture is also the most fre­quent in the vis­i­tors book at Chartwell, where it appears 86 times, more than any­one else (Bren­dan Bracken only 31, although vis­i­tors usu­ally signed only when stay­ing overnight, and Bracken fre­quently returned to Lon­don). He was invalu­able to Churchill in his abil­ity to reduce com­pli­cated sci­en­tific prin­ci­ples and the­o­ries to brief lay­man terms every­one could understand. Ardently pro-Churchill, Lin­de­mann sev­eral times clashed with gov­ern­ment sci­en­tific advi­sors. He wanted even more strate­gic bomb­ing of Ger­many than “Bomber” Har­ris; he opposed the effec­tive “Win­dow” (Chaff) radar jam­ming tech­nique; and he deemed Hitler’s V2 rock­ets imprac­ti­cal, until they began falling on Lon­don. On the other hand, he was one of the first to urge the impor­tance of atom bomb research. An excel­lent arti­cle on his wartime role is Antoine Capet, “Sci­en­tific Weaponry: How Churchill Encour­aged the ‘Boffins’ and Defied the ‘Blimps,'” The Churchillian, Spring 2013. The “stan­dard work” on Lin­de­mann is still the sec­ond Lord Birkenhead’s The Prof in Two World Wars (Lon­don: Collins, 1961), aka The Pro­fes­sor and the Prime Min­is­ter (Boston: Houghton Mif­flin, 1962). A more recent biog­ra­phy is Adrian Fort, Prof: The Life of Fred­er­ick Lin­de­mann (Lon­don: Jonathan Cape, 2003). Thomas Wilson’s Churchill and the Prof (Lon­don: Cas­sell, 1995) focuses on the rela­tion­ship in World War II, includ­ing Radar, the Ger­man Knicke­bein guid­ance sys­tem, strate­gic bomb­ing, even the Bat­tle of the Atlantic, includ­ing the com­par­a­tively neglected area of ship­ping to the Mid­dle and Far East. 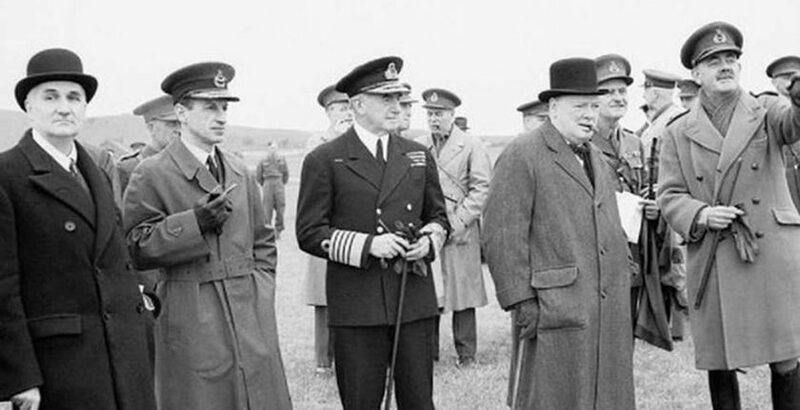 Wil­son also con­sid­ers Lindemann’s many memos to Churchill on post­war recov­ery. Despite deep hos­til­ity to Ger­many, Lindemann never bought into the Mor­gen­thau Plan of cre­at­ing a “pas­toral,” non-industrial Ger­many after the war. Featured image: Professor Lindemann, Air Mar­shal Por­tal, Admi­ral Cun­ning­ham and Churchill watch­ing an anti­air­craft gun­nery exhi­bi­tion, June 1941.